Temperatures will fluctuate, but no hazardous weather – Welcome to Wyandotte Daily! 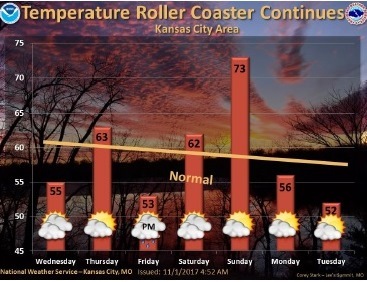 Temperatures will be very erratic over the next week however, no hazardous weather is expected, according to the National Weather Service. The best chance for precipitation will come late Friday through Friday night with just rain showers expected, the weather service said. Today, it will be mostly cloudy, with a high near 57, the weather service said. There will be a south southwest wind of 10 to 14 mph, gusting as high as 18 mph. Tonight, the low will be around 48, with mostly cloudy skies, according to the weather service. A south southeast wind of 6 to 8 mph is possible. Thursday, the high will be near 64, with partly sunny skies, and a light variable wind becoming north 5 to 7 mph in the afternoon, the weather service said. Thursday night, the forecast is a low of 43 with mostly cloudy skies and a north northeast wind of 8 mph, according to the weather service. Friday, there is a 20 percent chance of precipitation with a slight chance of showers after 1 p.m., the weather service said. The high will be near 54. Friday night, the low will be around 48 with mostly cloudy skies and a 30 percent chance of showers, mainly before 1 a.m., according to the weather service. Saturday, the high will be near 63 with mostly cloudy skies, the weather service said. Saturday night, the low will be around 53 with mostly cloudy skies, according to the weather service. Sunday, expect a high near 74 with mostly sunny skies, the weather service said. Sunday night, the low will be 46 with partly cloudy skies, according to the weather service. Monday, it will be partly sunny with a high near 57, the weather service said.